Facebook may have quietly introduced Offers in February, with the new feature only really getting noticed in April. The results, however, have been anything but quiet for a small Northern Irish hotel, with its latest offer claimed over 28,000 times in 24 hours, Simply Zesty reports. With the new feature, businesses can provide special offers to fans on Facebook, with these offers appearing in the newsfeed if you’ve ‘liked’ the page. The important twist to Facebook Offers is that when they’re claimed, they appear on the user’s timeline, and by extension in their friends’ newsfeeds. This worked in the Roe Park Resort’s favour, as in the space of just over 24 hours, its offer for a 1 night stay at the hotel for £42.50 went viral. As Simply Zesty point out, while this means big bucks for the hotel, to the tune of over £1 million, it also means that no money has actually exchanged hands and that if every single person who claimed the offer actually shows up, the hotel would have to accomodate over 3,500 guests per month until the expiry date in December. The hotel was, however, quick to advise people to check availability and make a reservation before showing up. A recent study by Socialbakers showed that a brand-related Facebook page with the highest rate of engagement has under 15,000 fans. Roe Park Resort only has just over 5,000 fans on Facebook, proving that it isn’t just about getting people to hit the ‘like’ button on your Facebook page to get noticed. Brands looking to choose between Facebook Offers and daily deals sites like Groupon or LivingSocial are facing an interesting dilemma. While Groupon caters to a wide consumer base of users already on the look out for a good deal, Facebook Offers widens the net a little bit, by turning the Facebook user into the actual marketer. It puts the viral nature of the Facebook newsfeed to good use. 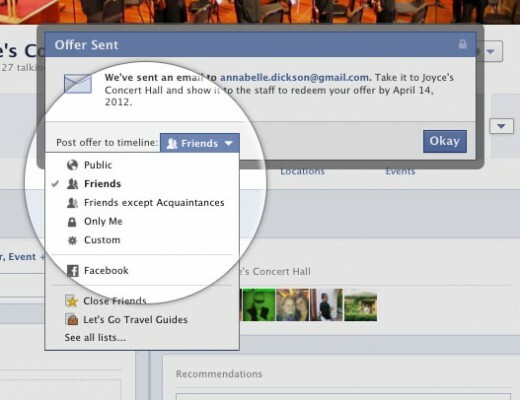 When an offer is claimed on Facebook, it will be automatically added to your Timeline. That said, you do have the option to make it a private post. On the flip side, while Roe Park Resort’s success might be great news for brands, some Facebook users might not feel the same way. As we pointed out when Offers first rolled out, while you can mute updates from specific pages, you can’t mute Offers in your newsfeed altogether. Offers are only available to a limited number of businesses at the moment, as the feature has not been rolled out to all accounts.